Of course, as is the case with most new mothers, reality turned out to be a little different to my imaginings. I ended up with a baby who was happiest in my arms and I was happy to oblige, which meant my ability to knit or crochet was severely curtailed. In fact, while I have crocheted intermittently since M’s arrival I had not picked up knitting needles since her birth until earlier this year! My first knitting project was started at M’s request and was Miss Sophie Bear. My knitting break has left me with a stash of baby patterns and yarns, but instead of a baby I have an independently minded four year old, who has definite opinions on what she will or will not wear. 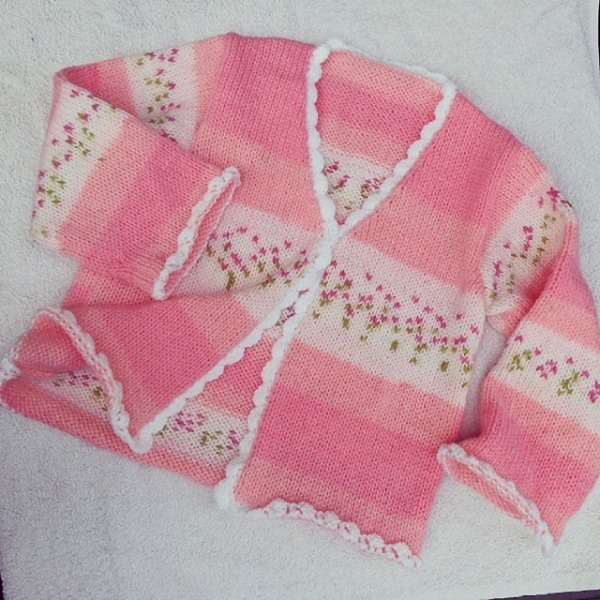 I was determined to knit some of those baby patterns, with some of that yarn so was delighted to discover the Sirdar patterns I’d bought are actually sized from birth to seven years. While I may be knitting again, I have to sneak it in around the edges of everything else I do, as spare time is practically non-existent these days. This means it takes a comparatively long time to make anything up and I make mistakes as I don’t have time to concentrate properly. I decided that with only three years to go before M outgrew the patterns, I needed to get started knitting straight away. I chose the simply named ‘Design E - Striped and Plain Cardigan’ from Sirdar’s Little Stars and Stripes, which is a basic cardi with set in sleeves, a ‘V’ neck and fastened by a single button. A little lace adds interest at the cuffs, bottom, fronts and collar. The yarn I chose from my stash was a pretty pink, self striping special deal from Aldi in a DK weight. Nothing in the way of natural fibres, but soft, cheap and picked up in a haze of hormones a few years back. It knit up nicely on 4mm needles, to the desired gauge of 22 stitches x 28 rows = 4 inch square. Here is the result, pre-blocking (link to my Ravelry project - here). And here, after some steam had been applied. Finished cardigan after blocking, curl much improved but still sneaking in. Oh how that lace edging taunted me… It curls horribly at the cuffs and needed some seriously blocking to sort it out, but since I was working with a ‘baby’ yarn (code for acrylic), I was very timid when it came to blocking as it is so easy to over do the steam and kill the fabric. I did steam block this, but not heavily due to the acrylic fibre and although it was improved by blocking, that lace edging still has a slight curl to it, particularly at the sleeve cuffs. Close up of the lace edging (after blocking). If I make this cardigan again, I will probably skip the suggested lace altogether and crochet a shell edging instead. I worked the edging (both the suggested lace on the cuffs and bottom, and the crochet edging) in a white baby DK from my stash. This contrasted nicely with the pink self striping. I added a single lilac button from my button tin, which immediately decided it was a complementary shade of pink once I had sewn it on. I am very pleased with how this turned out. I haven’t knitted many cardigan’s and due to the long break, this project represented a lot or re-learning old skills. I tried to stick to the pattern, but couldn't resist doing my own thing when the lace edging didn't behave, which was why I substituted with a far more civilised and far less scary crochet edging. The finished cardigan, modelled by my 'baby'. M likes the cardigan too. However I have a problem. She took a great deal of interest in how this project developed and has discovered my Ravelry queue which she has now co-opted. Rather than another cardi from my baby knits list, M has insisted my next knitting project should be a cat.